Carrying on with my recent Urban Decay purchase reviews, today I’m blogging about the Urban Decay Naked Skin One & Done Hybrid Complexion Perfector (£25). So it seems to be a BB cream, light coverage, some skincare benefits and some optical blurring. One & Done is available in six shades, and given their sheerness, these are workable for various skintones. The packaging is a plastic pump-tube that holds 40ml of product but I have to say it doesn’t seem that much when I compare it to my other foundation bottles! Time will tell when I see how long it lasts I guess! The texture is extremely light, and as you might imagine, sheer, but thanks to whatever witchcraft Urban Decay have used when making this, the coverage on my skin is pretty great. I need concealer on any blemishes and shadows, but otherwise it’s great coverage. For most skins, you can probably skip moisturiser as this is a moisturiser in itself, however for my dry skin, I still need my moisturiser. Another aspect of this products witchcraftery is the colour, whilst appearing a little orange hued on my arm swatch, it is nothing of the sort when on my face. The colour is perfect. I feel like I’m always going on about my skin, but for reference and in case it helps anyone, my skin is very prone to dryness as well as acne, and in addition, I seem to get large cystic spots from lots of products, especially silicones and very rich moisturisers, but this has not caused me any blemishes, and nor does it stick in my dry patches when I apply it. There aren’t many skin types I would imagine this isn’t suitable for, except perhaps those who require or desire a heavier coverage. If however your skin is plagued with occasional blemishes, don’t just skip this, you might be surprised at the coverage. 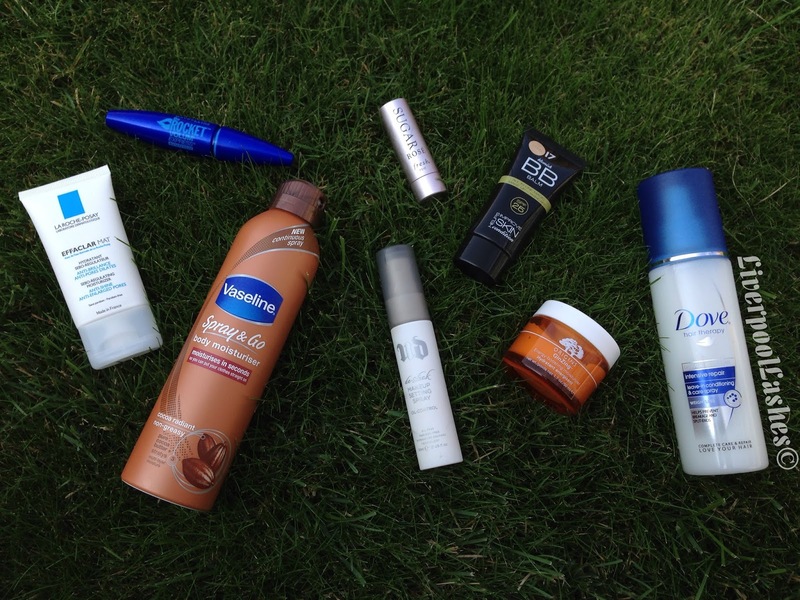 It is perfect for anyone who wants a light coverage for summer (did I mention SPF20?) or indeed all year round. Just to finish up, here’s me wearing it. A definite recommend from me. I am wearing shade Light, and I wear 3.5 in the Naked Skin foundation. If you already wear the foundation, there is a guide on the website (In the product description for One & Done) which will tell you which shade would be best for you. I purchased mine from the Urban Decay counter at Debenhams, where it cost me £25 for 40mls. Who doesn’t love Urban Decay? Not many people I know that’s for sure, and my blog stats tend to point towards my Urban Decay posts being my most popular. It’s fortunate then that I have a few more posts lined up! Starting today with the Urban Decay Naked Skin Illuminating Beauty Balm*. The Illuminating Beauty Balm promises to minimise the appearance of pores, lines and wrinkles, while feeling lightweight on the kin and offering radiance. It’s oil free, which is great for my spot prone skin and can be worn alone, or under foundation if you want to add radiance in that way. It’s not only cosmetic though, it promises to also offer long term anti-ageing benefits, by way of protecting the skin from daily stress, as well as improving elasticity. Love the packaging too, I really like how Urban Decay design fun products, that don’t lack class. Squeezing some out of the tube, my first thought is that the shade looks suitable for my skin, and while I can see a slight shimmer it looked as I’d expect a product designed to give glow. Blending the product out a little I start to see glitter. Not chunky glitter admittedly, but perhaps shimmer is a better word. Unfortunately, the same holds true when you apply to your face, look closely and you’ll see a fine sprinkling of quite obvious shimmer, all over. That said, take a step back and its no longer as obvious. Thanks to the hormones, my skin is a bit blemish-y at the moment so I’ve not worn this without putting foundation over the top, but wearing it in that way works really well for me. It may be something to do with the fact that I wear the Urban Decay Naked Skin Foundation, but these two products go together really well. That glitter/shimmer is no longer apparent but the radiance is and its really effective. I rarely skip a highlighter these days, as my skin is lacking in radiance, but with this under my foundation I found my face isn’t as flat without a highlighter meaning I feel happy to skip that step. It wears really well, and my foundation applies perfectly on top of the BB with no conflict. I’ve also tried it with Clarins Everlasting Foundation with the same results. I’m not sure how happy I’d be to wear this alone, solely because of the shimmer aspect, its not densely packed with shimmer, its more sparkles dotted all over your face, but again, I may be overly critical, just take a step away from the mirror and they are not apparent at all. Under foundation though, this is fantastic, works really well for me and wears well too on my fussy skin. The Urban Decay Naked Skin Illuminating Beauty Balm retails at £23.50 and is available from Urban Decay online and counters nationwide. *Product received free of charge for review purposes. Bobbi Brown’s BB Cream isn’t a new product on the market, but what is new is that they’ve added four new shades so it now caters for even more skin tones. So that’s good news! What isn’t good news is that I haven’t been getting on too well with this product 🙁 In the official images the models look absolutely stunning with flawless glowing skin and I want that too, I really want that, alas, I didn’t get that! So unlike some BB Creams, this is more of a true BB rather than some of those on the market that are really just tinted moisturisers. This BB can be used either as base for your foundation or alone as a lightweight foundation. It promises to cover imperfections and even skin tone, draw moisture to the skin and help oil control, brighten dull skin instantly and over time, reduce the look of wrinkles and shield the skin with it’s SPF 35 and anti-oxidants. The colour I’ve been using, Light, is perfect for me and what I do really like about this is the level of coverage, it manages to look as though it’s not there whilst doing exactly as it promises and evening out skin tone and covering small imperfections (you’ll still need a concealer on pesky spots)…but alas, that’s where my love of this BB ends and I so wanted to love it. You all know I’m a big Bobbi Brown fan and I have quite high expectations but alas this didn’t suit my skin type at all. It settled in to every dry flake, (I didn’t know I had) every pore, and every line. It just didn’t work for me at all. If you really zoom into the second pic below, you can see how it’s settled into all the lines on the back of my hand, although it’s not really noticeable unless you’re up close. I think this would suit anyone who doesn’t have stupid skin like mine. On the plus side it’s totally reminded me how much I DO love the Bobbi Brown Foundation Stick. My love for this grows daily, easy to tweak your coverage where you need it, convenient to apply and I love the finish. Sorry Bobbi Brown BB Cream SPF 35, it’s not you, it’s me. If you do fancy this, you can purchase it from www.bobbibrown.co.uk. Guest Post: Karen from Liverpool Lashes! Hello! Hope you’re all well! I’m Karen from LiverpoolLashes Blog here doing my first guest post ever on Charlie’s blog! Today I wanted to talk to you about my essential beauty products for summer. If you’re anything like me I like to sieve out my regular products a little for the warmer weather, keep things a more minimal for make up but add more skin protecting products instead so lets get started. Vaseline Spray & Go Cocoa Radiant – The last thing you want to do in the summer is apply a thick body butter so this product is ideal. It’s a fine mist that barely needs rubbing in as it sinks right into the skin at a lightning speed and smells amazing. It’s also lso available in Aloe Fresh and Essential Moisture. Dove Hair Therapy Leave-In Conditioning & Care Spray – At this time of year it’s not just your skin that needs that extra boost of moisture. This is another fairly new product that helps prevent breakage and split ends. It can be applied to wet or dry hair and once it’s on it’s weightless so there’s no feeling of limp, weighed down hair. Your hair is left feeling super soft with a gorgeous scent. Fresh Sugar Rose Lip Treatment – Lips can often be forgotten when applying your SPF so this is a perfect ‘on the go’ product with an SPF 15 whilst also providing essential hydration with a subtle rose coloured tint. Origins GinZing Energy Boosting Moisturiser – Probably my favourite face moisturiser ever and that’s really saying something. This lightweight gel-like moisturiser is dribblesome with it’s fresh and zingy orange scent. It sinks in quickly so that you can apply your make up straight away and truly is really refreshing. I’d even go as far as to say that this is actually one of my favourite parts of my morning routine. Extremely highly recommended. La Roche-Posay Effaclar Mat – This is a product I don’t hear an awful lot about but it’s really good. Officially it’s a moisturiser that gives a matte finish but I use it as a skin mattifying base for my make up. If I’m not wearing make up I use it just to take the shine away. It really is a great product! Urban Decay De-Slick – When the temperature rises it can definitely take it’s toll on our make up so thankfully Urban Decay have this amazing make up setting spray to keep your make up on for longer. It’s available in a two sizes so perfect for your handbag as well as your dressing table. 17 BB Cream – Most of us like to keep things lighter with our make up but 17’s BB Cream is an unexpected favourite of mine. The coverage is brilliant, far better than the higher end brands I’ve tried but still feels just like a moisture on your skin. I have a full review with swatches on my blog for this one. Maybelline The Rocket Waterproof Mascara – In summer I think that it’s a great look to go ‘fresh faced look’ with just a BB cream or tinted moisturiser and mascara. Okay i’ll admit I threw this one in as a summer essential but it’s really a holy grail – there I’ve said it! If you have straight lashes that don’t seem to hold a curl you need to read my blog post posted on the 24th June called ‘Keeping Straight Lashes Curled’ – it will change the way you think about your lashes! If you made it to here then thank you and a massive thank you to Charlie for letting me write it! I hope you enjoyed it half as much I enjoyed writing it. If you did then feel free to come and visit my blog, I have a post up every single day which is mainly a product review but sometimes I post about my work as a nail technician & beauty therapist. Many thanks to Karen for helping out while I’ve been away, please do head over and take a look at her lovely blog! If you’re a reader of my sporadic and usually inane tweets you’ll have seen me tweet a couple of weeks ago that I was totally over BB Creams. Typically one turned up for me to review shortly after that and given that it was Clarins soon to be released BB Cream and I believe Clarins bases to be right up there amongst the very best you can buy, I clearly had to try it out. Was I won over by this BB? Read on to find out. The Clarins BB comes in three shades, Light, medium and dark and has colour matching technology which means it adapts to your own skin tone, which I’ll talk about a bit more shortly. It provides SPF25 and aims to even skin tone, protect and revitalise. I’m more enthused about this than I have been about any other BB cream. It applies like a dream and it leaves my skin with a “satin” finish, its really quite magnificent and makes my skin look nearly flawless. Unlike some BB’s it offers good coverage and can be worn alone on days when your skin is less than perfect. It’s quite clearly far too dark. But what about that colour adapting technology then? Well amazingly it does work. When I applied this too my face it did settle into a much more suitable shade it was still a tiny bit too dark for me though but regardless it was nearly passable. So I adapted it a little further. Using my Bobbi Brown Foundation Stick which is much paler, I added it down the centre of my face… down my nose and chin mostly, but only a tiny bit, blending it out so there was no join. This worked perfectly for me. My cheeks and forehead remained as just the BB. It was almost like I’d added a light touch of bronzer to those areas. So here’s how it looked on, in conjunction with just the merest touch of Bobbi Brown Foundation stick to lighten up the centre of my face. So this is nearly a winner for me, It makes my skin look great, it blends easily with clogging in my danger zones and I adore the satin finish, and for anyone my shade and darker (Bobbi Brown Warm Ivory, Mac NC 15 if that helps) this should work, thanks to that colour adapting technology. You can see my face is nowhere near as orange as my hand was. It’s magic! Clarins BB Skin Perfecting Cream launches in May and will retail at £28. Gorgeous collection from No7 for Spring…the very title of the collection, Ballerina Beauty, conjures up ethereal, light, pretty and spring-like colours and that is indeed what No7 Creative Director, Lisa Eldridge has conjured up for us this season. You need to get your base right for this look and for that you’ll need the No7 Beautiful Skin BB Cream (£12.95). Given my current skin issues I’ve not actually tried this one out yet which is a shame, but I’m currently sticking to things I know from experience won’t cause my skin to flare up. I’m saving this one though for better days in the future. Once you’ve got your base sorted it’s time to start on the eyes. There are two Stay Perfect Eyeshadow shades in the collection, Innocence and Wheatsheaf (£7 each). I have Wheatsheaf. A very light wash of colour for me, with just a hint of shimmer. Very pretty it is too. It’s a little washed out by sunlight in the photograph before but the shade is a peachy beige shade, whereas I believe innocent is a white-ish shade. The finest felt pen style liner I think I’ve ever used! I’m still absolutely rubbish at applying it, but it’s very impressive and very black. You can see both of the above in the two pictures below. Extravagant they are indeed! I have to confess I’ve not put these on yet! I took one out and held it up to my eye and it looked so big and scary I chickened out. I’m not a false lashes kind of girl, I only wear them once a year, but these are very fluttery indeed! So so pretty! Lovely sturdy compact that screams quality. I find this blush to be very pigmented (I suppose it’s the darkest of the pinks in the fan shape that adds the most colour) and the first time I wore this, I majorly over did it… since then I’ve used less and this is a perfectly pretty pink flush of colour. It’s absolutely gorgeous. And such a beautiful looking product to own! My second favourite thing in the collection. A beautiful lipstick, a gorgeous shade and a lovely soft shiny (but not glossy) finish, and fully opaque, although it is very easy indeed to apply lightly to get a softer finish. It feels really beautifully moisturising too. Finally the nails, there are two nail varnishes, Get Wed and Tip Toes (£6 each). I’ve not yet tried these out, my nails are very short and not in a good enough condition for me to want to photograph for the blog, but both shades are very pretty, lightly shimmering and perfect for the Spring. I don’t find the wear time too great on No7 polishes in general, but I’ll be trying these out as soon as I can with my best base and top coats. I want to wear them! So there we have it, a beautiful Spring collection from No7, here’s my full face, minus the BB Cream and Lashes! I know, I look absolutely nothing like a delicate ballerina, but I certainly feel set for Spring! Anything here take your fancy? I think it’s a really beautiful collection, full of stand alone items that are staples! Last night I was thinking about how my product of the year was a no brainer…until I remembered something so obvious I can’t believe I forgot about it! Anyway without further ado. My Top Two products of the year, in absolutely no order of preference because they are both wonderful. The other item I’m awarding Product of the Year to is of course the Too Faced Natural Radiance Palette. You can find my full review here. I raved about it and nearly a year on I’m still loving this, in fact despite regular use I still have plenty of product left which was my only concern, I thought it may get used up quickly, but when so little product goes so far, this lasts and lasts. Contains everything you need to get a healthy glow on and to sculpt a bit of structure to your face, this instant healthy glow in a palette. I’ll be getting a replacement for this in due course and I cannot WAIT to see the new No Makeup Flawless Face Palette which looks to be similar but different shades. I have very high hopes indeed. So those are my top two picks of 2012 and used together you’re going to look absolutely radiant, no doubt. I’d love to know what products you rated this year? Anyway, whatever you are up to this evening, I wish you all a Happy New Year. I will be sat at home doing nothing, and thats just how I want it to be! Hello summer skin product of choice! Please meet Omorovicza Complexion Perfector BB SPF 20. Lets just get the price out of the way first, it’s £80. Is it worth it? I think so, would I buy it? No, but only because I don’t have that kind of money for a BB, if I did, I’d buy it. A little bit of background on this beautiful brand. The founders of Omorovicza, Margaret and Stephen de Heinrich de Omorovicza met in Budapest. 2,000 years ago Huncary’s thermal waters were discovered to have curative properties and the famous baths were built. Whilst Margaret and Stephen were relaxing in the ancient thermal baths the couple were amazed by the effect of the mineral rich water on their skin and they saw their potential to be harnessed in a skincare range…with a Noble-prize winning laboratory of dermatology Omorovicza Cosmetics developed Mineral Cosmetology which was then launched in 2006, in Budapest. Since then the range has gained an international following and is much loved by beauty editors. And I have to say the range sounds incredible. Margaret sent me the stunning Complexion Perfector BB to try out and I must say it arrived at a bad time, when my skin was suffering its awful reaction to the mask I used a month or so ago… but as soon as I was fixed and needed less coverage, and the weather warmed up and I wanted less product on my face, this came into it’s own. A moisturiser, foundation, sunscreen, concealer and anti-aging cream all in one and I have to say my absolute favourite out of all the BB’s I’ve tried. No silicones for a start. Then there’s plumping and resurfacing over time, there’s Vitamin C to boost collagen and reduce free radical damage, white lupin to energise and revitalise, ruby crystal to minimise the appearance of fine lines and imperfections and Mineral Cosmetology, a patented mineral delivery system to leave skin firmer, more supple and younger looking. Sounds incredible, and it is. The only things I want to add are as follows, applies flawlessly, covers redness well but I needed extra concealer on my blemishes, the shade was perfection for me and it feels weightless on your skin…just like you’ve rubbed a light moisturiser in. I can’t rave about this enough. I’ve been wearing with a dab of concealer on blemishes, and certainly absolutely no powder, I don’t want to lose the glow. I am going to cry when this runs out. It’s absolutely stunning. High price to pay, not too much in the sense that its not worth it, just too high for my personal financial circumstances, but if things were different, I’d never use anything else. The rest of the range also looks sunning. Queen of Hungary Hydrating Mist… yes please!! Gold Flash Firming Serum.. yes! Instant Plumping Cream sounds amazing as does the Copper Peel and the Thermal Cleansing Balm… truly I could go on. What a truly beautiful range of products. Highly highly recommended. So the latest BB Creme to join my collection comes from Estee Lauder. I’m still relatively clueless as to what it is about BB Creams that is making them the must have product at the moment. These are truly beauty phenomenons that I remain largely ignorant about! So it’s with some trepidation I approached this one. This Estee Lauder offering promises and instant, even toned, healthy look, the most effective anti-oxidant power ever (! ), SPF 35, oil free hydration and oil control. It’s available in two shades and as with the Clinique BB Creme I don’t think the shade range is adequate. Certainly not for the very palest or darkest. The idea is that you use this as a last step in your skin care regimen and you can wear it alone or under your foundation depending on how your skin is, or what kind of coverage you like. The cream itself is very thick and a little goes a long way so a 30ml tube should last a long time. Here’s a little look at Shade 01. I think you can probably tell this a little orange on me. It’s not too much of a problem for me for two reasons. The first is that when fully blended out it is fairly sheer so it’s not so obviously wrong, and the second is that I am unlikely to wear this without foundation covering it in some part at least. Here it is on my face with nothing else. So my observations are as follows. This would be great for anyone who is a little oily as this is very matte, not only is a very matte finish but it really does keep oil at bay for quite some time. I tend to not suffer with oily skin but can get a little shiny on my nose towards the end of the day, and found that this was very much kept at bay. I personally don’t favour a matte finish so it’s not ideal for me but I have found ways around that and in my case, because I frequently need greater coverage (I do suffer a lot of hormonal spots that seem to linger a long time) I find that I can use this BB creme all over my face and then use my foundation of choice to add greater coverage where needed, usually down the centre of my face, and it does seem to blend seamlessly with no problems. So for me this product isn’t perfect, I’d like a slightly paler shade but 01 isn’t TOO bad, and I prefer to not have a matte finish, but I can add a bit of glow back to my skin with foundation or highlighters where necessary. I do think this would be a fantastic product for anyone who suffers with oily skin, because this looks matte and stays matte incredibly well. Very impressive. It’s not a cheap product at £32 but it’s skincare built into your base and a little really does go a long way indeed so a tube should last a long time. I don’t get BB Creams! I really don’t get them. I’ve read about them, I’ve seen lots of them on blogs. I read brand descriptions of them but I’ve yet to understand why I would want to use one instead of foundation or tinted moisturiser in the Summer. It’s not that I don’t want to understand, I really do, but I think the problem is that they all do different things. In short though here’s what I do know. BB stands for Blemish Balm, but it’s not a spot cream. It provides a small amount of coverage but it’s not a foundation. Some, like this Clinique offering, have anti-aging properties. They have primer properties but can be worn alone and have healing properties to help banish blemishes and they nearly all offer SPF. Clinique’s offering provides a fantastic SPF of 30 which is great. The Age Defense BB Cream is suitable for all skin types and is easy to apply. You use it after moisturising and over your entire face. It’s available in two shades, 01 and 02. I’ve tried both and 02 was completely wrong for me, far too orange, so I was sent 01 to try out. My initial impression was that it was far too pale…and don’t get me wrong it is incredibly pale, but then I am pale and it works perfectly well on my skin, colour wise. I’ve heard tell of it having a grey tint and I have to say that when I was blending this into my face I did get a flash of grey which alarmed me at first, once fully applied and settled into my skin I couldn’t spot the grey at all. In terms of coverage, at this time of year this isn’t enough coverage for me, never mind my hormones seem to be playing havoc with my skin, more than usual of late, so I’m happier with more coverage, this will however be perfect in the Summer for me, so long as it then isn’t too pale. I can’t see I’ll ever match a shade 02, not unless I fake tan and I don’t fake tan. Here’s how my face looks with the Clinique BB cream. I’ve kept the rest of my make up to an absolute minimum so the focus is on how my skin looks. It’s very natural. All my freckles are showing through and in fact I’d go so far as to say it looks as though I’m not really wearing anything on my skin, which is actually a good thing, well on good skin days it’s a good thing. It is SO pale that I could really benefit from some extra blusher, but otherwise it’s good. I do find that my fine lines and wrinkles are less obvious and my skin feels very smooth. I have tried this as a primer also, but since I favour heavy foundations, it’s all a little much for my spot prone skin. No, I’ll be keeping mine to wear alone on good skin days, particularly in Spring and Summer if they ever come. Really I don’t have many grumbles about this, it’s nice, but the main problem is the colours. Having tried both of the available shades I can guarantee that many people will be unable to find a match. Although sheer, they do still impart colour I’m not convinced two shades will fit all. The All About Age Defense BB Cream is £25 for 40mls and lets hope that more shades will be added in future!